The Mega-Kart 8GB Is Unfortunately Small Enough To Fit In Wallet | OhGizmo! By David Ponce on 10/03/06 • Leave a comment! We’re noticing a rather stupefying marketing trend that seems intent on selling presumably delicate electronics in a format that encourages its owners to place them in their wallets; namely, making things “credit card sized”. This of course invites nothing but tears, violent hair-pulls and drama… but who are we to question people with diplomas? 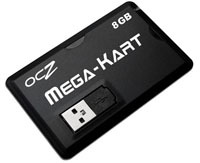 The latest such device is the 8GB Mega-Kart from OCZ Technologies. It looks a little like the lower capacity, uglier brother of PQI’s U510. Most such credit-card sized drives top out at 2GB, so this one’s a good size. It comes with an extensible USB 2.0 connection and will work with Mac, Windows and even Linux. Dimensions are 85mm x 54mm x 3.5mm (L x W x H), which is indeed quite small. Unfortunately, price or availability seem to have been left out at this point. If anyone know more, let us know.